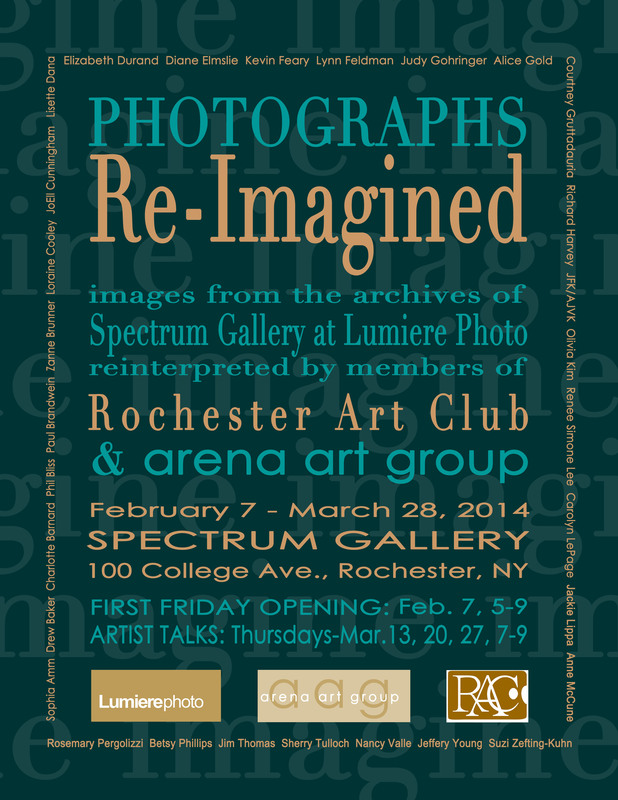 Photographs Re-Imagined Exhibition Opens Soon! 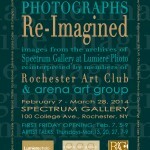 The following Rochester Art Club members will be exhibiting their interpretations of 15 photographs chosen by William Edwards of Lumiere Photo beginning Friday, February 7th at 6PM-9PM in the Spectrum Gallery, 100 College Ave. Rochester 14609: Drew Baker, JoEll Cunningham, Lisette Dana, Andrea Dionese, Diane Elmslie, Kevin Feary, Alice Gold, Richard Harvey, Olivia Kim, Renee Simone Lee, Jackie Lippa Anne McCune, Rosemary Pergolizzi, Sherry Tulloch, and Suzi Zefting-Kuhn. Fifteen artists from the Arena Group re-interpreted the same 15 photographs. The opening reception will be Friday, February 7th 6-9PM. Artists Talks will be Thursday 3/13, 3/20, 3/27 from 7-9PM. The show closes March 28th. The Rochester Art Club 2014 Spring Art Exhibition will open to the public on Monday, February 17, 2014 at The Patricia O’Keefe Ross Gallery in the Joseph S. Skalny Welcome Center, St. John Fisher College, 3690 East Avenue, Rochester, NY 14618. The exhibition will run until March 31, 2014. Receiving: Thursday, February 13, from 3:30 pm – 5:00 pm. Judging: Thursday, February 13, from 6:00 pm – 8:00 pm. Oxford’s first exhibit of 2014 features two artists who have recently garnered much national attention. Patricia Tribastone and Ray Hassard have both attained the Pastel Society of America’s designation as Master Pastelist, although both also paint in oil. In January, 2010, Rochester’s Tribastone was the focus of the cover article of American Artist, and she was again featured in the fall of 2011 in American Artist’s “Guide to Painting Flowers.” In 2013, she was awarded first place (oil and acrylic category) at the Hilton Head National Biennial Exhibition and received the Diane Bernhard Gold Medal award at the Pastel Society of America’s annual exhibition. She appears currently in the January/February (2014) issue of Pastel Journal. In 2013, Cincinnati artist Ray Hassard was profiled in both Plein Air magazine and American Art Collector. He received the Gold Medal award in Pastel Journal’s “Top 100 Paintings in Pastel for 2013,” and he will be featured in Pastel Journal’s March/April 2014 edition. The Oxford Gallery is located in the Roosevelt Apartment Building at the corner of Oxford Street and Park Avenue in Rochester. Gallery hours are Tuesday through Friday, 12:00 Noon to 5:00 P.M., and Saturday, 10:00 A.M. to 5:00 P.M. Admission to all events at the Oxford Gallery is free. For information, please call 585-271-5885. The exhibition of recent paintings by Patricia Tribastone and Ray Hassard begins Saturday, January 25 and continues through Saturday, March 1. An Artists’ Reception will be held Saturday, February 1 from 5:30 to 7:30 PM. The Reception is open to the public. Congratulations to the following Rochester Art Club members who won awards in the Genesee Valley Plein Air Painters Ninth Annual Plein Air Art Show at the Pittsford Barnes & Noble: Kathy Bolin, Kevin Feary, Gil Jordan, Don Grieger, and Alan Brewen. The show runs from January 1-January 31.